The Independent Living Centre of Waterloo Region is committed to the removal of barriers for people with disabilities. We believe that the first and most important step to creating a barrier-free environment is to educate our neighbours without disabilities about the barriers that exist and how we can work together to remove those barriers. 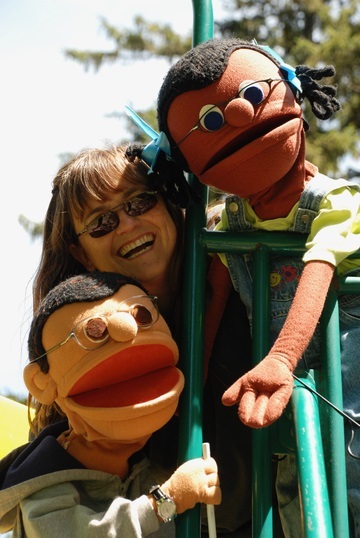 Kids on the Block is a troupe of puppets that educate children about inclusion and accessibility. This program has been delighting children with entertaining and educational puppet shows for over 35 years. The crew, comprised of puppets with and without disabilities, offer kids the opportunity to learn both about specific disabilities and also broader themes of friendship, community-building and the importance of expressing feelings and celebrating difference. These 45 minute performances are offered to children in schools, places of worship and community groups, and are most effective with group sizes of up to 75 people. However, no group is too large or too small! Groups of any size can be easily accommodated. The presentations are geared towards audiences from K-6. However we will perform for audiences of any age. Thanks so much for coming to our co-op last week. The kids were thrilled and the puppets were amazing. One of the kids actually used the lines from the bullying script with some conflict on her hockey team. SO AWESOME! Improving accessibility and inclusion for people with disabilities are the goals of our Beyond Barriers program. Traditionally, barriers are regarded as strictly physical or structural in nature; things like narrow corridors, stairwells without accompanying elevators, or a lack of automatic door openers in public places. However, these examples illustrate only a small part of the vast spectrum of barriers that exist for those of us with disabilities, even in our own community. In fact, the short-term effect of physical barriers pales in comparison with the lasting effect of attitudinal barriers faced by individuals with disabilities every day. Negative attitudes toward disability are the biggest barrier of all, but it is also the barrier that every one of us can help to break down. The Beyond Barriers program uses education to begin the breaking down of obstacles to full participation for all citizens. And, with the passing into law of the Accessibility for Ontarians with Disabilities Act (AODA), it has never been more important for members of the business community to be aware of barriers that exist and how to overcome them. 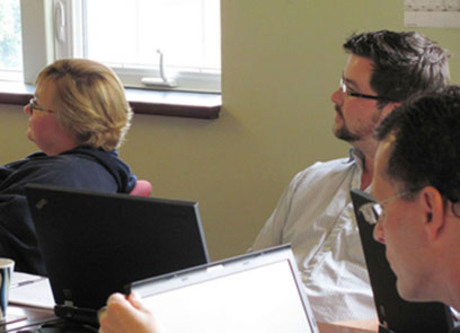 The Beyond Barriers presentation model can be tailored to any audience, and is offered in full-day, half-day or one-hour formats. We are happy to visit high schools, colleges and universities as well as local businesses and community groups.